Blizzard has posted an update to the changes coming in PvP with Battle for Azeroth. First of all, PvP changes will be live with the pre-patch. Side note: Icy Veins noted last night, beta calendars are showing a "War of Thorns" event coming on July 17th. This event surrounds the burning of Teldrassil. Icy Veins is speculating pre-patch events will start a week before "War of Thorns" because Blizzard would not want to major events to start at the same time. Therefore, July 10th. Another side note: Ion Hazzikostas said, in the most recent Q&A, the new PvP season will start 3 weeks after BfA launches. This means, we can start working on our hippos right after the US Labor Day holiday, September 4th, after reset. 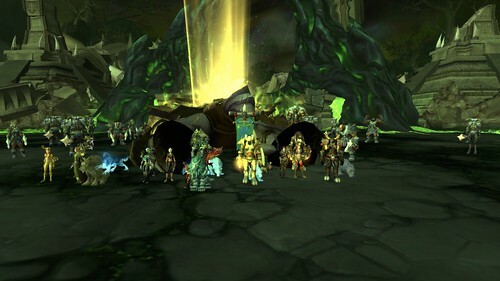 The first raid and mythic plusses will open at the same time. What does this mean? With the pre-patch, we will have a chance to test out the changes to PvP. 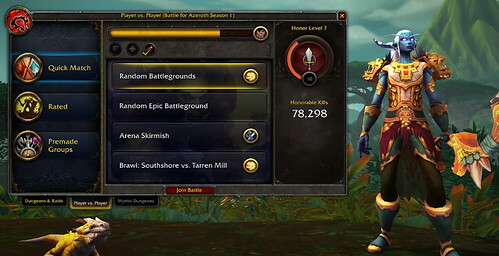 Blizzard posted a photo of the new PvP interface. There are two screens. The first one is an overall PvP screen. I like this; I like this a lot. Important information is right in front of you in a font I won't need my glasses to read. Your accrued honor is to the right. All the PvP you can do this week is in the center, with the bar you fill up to the next reward plainly visible on the top of the center. For those of you who are multi-class, your check boxes are visible in the center. On the left, if you are looking for specific types of PvP, you have the option to click the kind. I like, in particular, how the brawl is clear. No more drop down menu to see what it is to decide, nope, not gonna do that one. Too much grief. Much more important, particularly if you are aiming for a vicious hippo, is the next box. Rated PvP is the ONLY way to get the hippo. Those of us who have revelled in the daily PvP at the Legion's various towers can't get a hippo that way. Nor can you get a hippo just by randomly, or intentionally, queueing for battlegrounds. You can still up your honor totals, but the vicious hippo mount is not yours via that route. We’re also changing how players can earn Vicious mounts. In the current Legion system, you need to win 100 Rated 3v3 Arena or 40 Rated Battleground matches. In Battle for Azeroth, Rated play in any bracket—including 2v2! —will count toward earning these mounts. And in line with our philosophy around making cosmetic rewards account-wide, your PvP efforts account-wide will count toward earning these rewards for your collection. It's been known, for some time, PvP awards will be account-wide. This is great news for those of you who PvP on multiple players. (I salute you. The very thought chills me to my bones.) For you players willing to bring whatever class is needed to a group, your aggregate victories will all count toward the mount. Gone are the days of being stuck in one class. We need another healer and, bingo, we have one, because a win is another step toward a hippo. 100 Rated Arena or 40 Rated Battleground wins is still a daunting prospect for a guild which doesn't PvP religiously as a group. (Please, no jokes about hard-core PvP. We simply haven't done that here. It's a good story but that's not who we are, and you know that.) We will be doing once a week PvP beginning with the pre-patch, so we can get a feel for how this will work. You cannot be carried through this and I'm going to be upfront. If we officers don't feel you are pulling your weight, I'm going to make the difficult call to ask you to step down. This kind of PvP is not what we are used to doing. We all have off days and days when the RNG should be taken behind the barn and beaten senseless, but you NEED to know your class and spec. Your arena team or our rated BG team will be ripped to shreds if you are just mashing buttons. It's disconcerting in a raid to hear, "Well, I didn't know where my [insert spell] button was." In rated matches, this comment means death. This is difficult. We will be PvP'ing every single week because you don't get wins if you do this once a month. I want you to know, up front, what will be expected; to think about this, really think about it; and decide if you can dedicate time to this mount. Here's the photo again, for inspiration. Therefore, you can sign up here and now if you want to be included in this. This will count toward your 2 event per month attendance requirement. You do not have to come to every week's PvP event. I don't think even I can do that, given my work/life schedule. But you have to be willing to come to at least 2 of the 4 scheduled days. 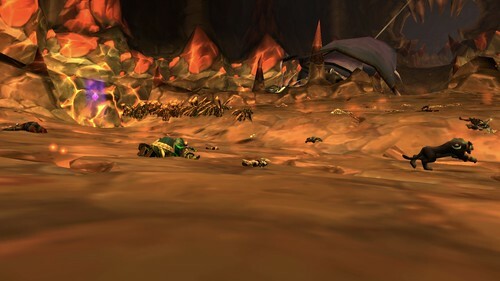 I do not want to be working on this at the end of BfA when we're facing people who started playing at the beginning. We'll rarely get a win then. You want to talk frustration? That's a supreme example of it. We don't make you do things you don't want to do. This is not a requirement, by any means. I do, however, want to be completely transparent with regards to what will be expected if you want this mount. This is going to require something totally different than our usual, "Hey come on and smash stuff" events. There will probably be suggested add-ons. I'm not going to go so far as to say you must play x spec, even though greater players than me will suggest x spec with x build for rated play. I chafe at that. I have my style of play and I will figure out how to make it work because I want a hippo. As more information is available, I will pass it on. We will do our best to have PvP events on weekdays and weekends to accomodate our various schedules. Time to consider whether you want to work towards this and, if so, sign up. The weekend just passed was full of adventure. The first positive is the bank has gone from Classic to Burning Crusades tmog gear. 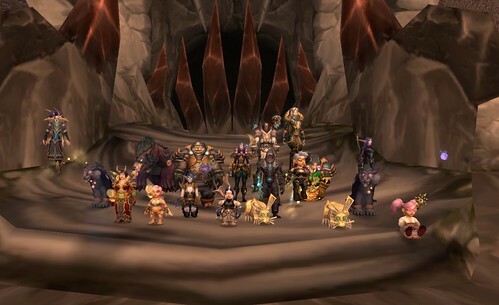 Those of you who do tmog have responded so positively to this idea, I think we'll do it again next year, once BfA is well underway and we know raiding schedules; maybe next spring, at the earliest. I want to thank everyone who donated Classic era gear. There were quite a few things my toons did not know, which actually surprised me. And I want to give a big shout-out to Cathalli who took her alt through most, if not all, of the BC-era raids and dumped a ton of gear in the bank. Seriously. Please check out what's there and take what you don't know. I've found a few pieces for Gimm and Epi, so I think you'll find a few for your toons. If you want to donate gear, but, say, the cloth section is full, send it along to SpecDeathbk. I monitor the bank and am happy to put your donations into empty slots. Next good thing. Deathtacular conquered Hellfire Citadel. Here's the thing about raids. Tarsan explains this a bit better than me but, distilled down, when we want to run mythic content, we need 16 people to get the achievement. This also works when we go backwards into heroic content of older raids which do not have a mythic component. We need to have 80% of the maximum number for the raid to count for the achievement. It's why, when we ran heroic Heart of Fear, we didn't get the achievement. We didn't have enough people. Deathtacular does not have heroic Heart of Fear, Throne of Thunder, or Siege of Orgrimmar. We don't have mythic Highmaul or Blackrock Foundry, either. It's all about numbers. We will put one of these on the calendar on a weekend in July so watch for it and please come. Also, check out the horde bank for tmog gear. We are not do the same kind of push horde side as we are Alliance side, but, if you are a tmogger, you should check out that bank. There may be something you don't know. There was death and destruction. We could get through phase 1 just fine, other than the accidental pulling of aggro which wiped out the melee on her left side, that one time. Amaera, who was our tank when we downed her the very first time, way back in March of 2008, was like wet tissue paper. Almost one cleave and she was dead. A lot of you have asked for feedback. Your officers spent a good hour, prohibiting Tarsan from eating a warm dinner, discussing this. We have thoughts. 1) Older raids are not as finely tuned as we would hope. This is evident in both how the mechanics scale relative to the toons, and how the toons react to the attacks. Ams' often immediate death bears witness to this. 2) Tanking at level older raids, particularly Wrath of the Lich King raids which are NOT Ulduar, is problematic. Remember, Ulduar has been retuned so it can be available during Wrath Timewalking events. Other raids have not. Our healers said it was all they could do to keep Tarsan up, let alone keep Ams up. Big heals were the norm, and that eats mana, as well as prevents the use of other heals. Would a third tank have helped? No. It would have been one more tank to try to keep alive with extremely limited resources. Would another healer have helped? Well.........that gets into the next point. 3) We did not have enough dps to down the adds in phase 2. We discussed this quite a while and I, initially, resisted the thought we didn't have enough dps. Now, more discussion later, I've come to see, we did not. 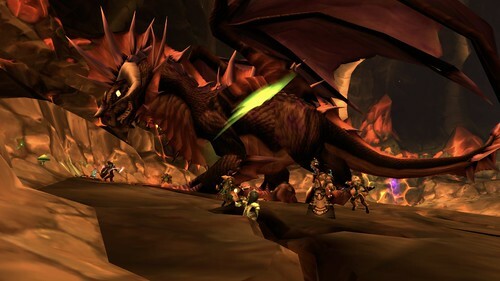 If you look at the center of this photo, you'll see people fighting an Onyxian warder. The gist of phase 2, which is the air phase for Ony, is the ranged piling on the dps; the "moar dots" phase, if you know the video; while the melee handles the incoming adds. These adds were, and still are, probably the bane of an at level group's existance. They hit like two oncoming semis AND they have a blast nova AOE which is an insta-kill if you get caught in it. You HAVE to run away. Fortunately, while they are channeling the AOE, everyone, including the tank, has time to get away, if you can run and aren't pinned against the wall. In the group we had, and this is not to knock us because we got her to 52%, we just didn't have enough dps to get Ony into phase 3 AND kill the warders. They come on a pre-deterimined schedule so if you don't have one dead before the next one shows up, you can quickly lose ALL your melee because of the AOE. The whelps need to be handled, but the tank not handling the warders can, with a healer, usually handle them. If one of our healers had gone dps to help with the warders or with Ony, we'd have been short heals. If one of the dps had gone heals to help keep the party alive, we would have been very short dps. It's a balancing act which we do every time we progression raid. 4) No, we didn't run logs because there's nothing to compare logs to. When logs are uploaded, there is already a baseline of information on what an encounter needs to be successful. There is no baseline data available for this encounter. If we do run logs, we'd be comparing any data to ourselves which wouldn't tell us whether we were meeting the baseline for the encounter. When Ony was new, you needed 3k dps from everyone to kill her. We don't know if that still holds or if another number is needed. So, where do we go from here? Well, we'd love to have more people in the group. There is time to level a toon to 80, freeze its XP, and run ToC for gear. There's also time for gems and enchants on any new gear you get. We are asking that you limit yourself to Wrath era gems and enchants, just because we're striving for some measure of authenticity. It really was this hard, folks. Ony returned in an October patch and it was the week before Christmas of that year when we downed her. I thought 3k dps was impossible to attain. I could get to 2.5, but how do people get 3K? We will be doing sporadic ToC runs for gear over the next month, for those of you who still need some. Please do NOT buy 264 gear. That's ICC level and we are avoiding this, as Ony would have been a stepping stone to ToC and then to ICC. Max level dropped in ToC is 254. Stay under that number. We will be going into ICC once we down Ony, just so you know, so ToC gear will serve dual purpose. If you are a multi-spec class and have healing or dps specs, we would appreciate it if you learned these. We do not need tanks. I'm going to state it right now. Amaera is one of the tanks, even though she died incredibly quickly. She was our main tank when we downed her and, as long as she can come to whenever we put this back on the calendar, I want her as the off-tank. If you have a tanking spec, you are free to learn that, but you won't be tanking. This is my decision. Tarsan is going to be the other tank as his survivability was proven. We are going to be doing indepth research into why Ams was wet tissue paper in the hopes we can figure this out. If anything changes, we will let you know. We need dps and healers. You can bring a set of tanking gear, just in case, but dps and healing is what we need. If you are interested in joining the legacy group and would level anything, we could use shaman and warriors. (Had we downed her we know that's what gear would have dropped, since we didn't have either class in the group.) Demon Hunters cannot come because you automatically start at level 98. We were also running a 25 man raid with 17 people. Ony is not a flex raid. She's 10 or 25-man, regular or heroic. While we kind of outgear the encounter with ToC amor and different talents that at launch, we were still running 17 people in a 25-man encounter. Getting her to 52% is a feather in our collective caps. I sincerely thought we could do it; we all did. We didn't know exactly how the raid would transpire going in. It was a learning experience. Towards that end, we've decided that, unless we have 21 or more people, we are going to break into 2 groups and down her in 10-man mode. What that means is that 3 people, most probably our tanks and one healer, will run with both groups in order for everyone to experience downing her. This is very important. It's not going to be an "A" team or a "B" team. It's just going to be two groups. Of course, if we have 20 people, we can run 2 10-man groups. If we have more than 20, we'll attempt 25 man again. It's a 2 tank fight regardless of the number of people. What will scale will be the need for healers. Lastly, all this goes ka-plooey when the pre-patch drops. Talents will be completely changed. I expect, on patch day, to log into big Gimm and find her tool bars looking like swiss cheese, I expect no less from Lil'Gimm's tool bars. We are looking at another Ony attempt at the end of July to give you a chance to get used to whatever they do to our talents. It could be we'll find things better or, worse case scenario, horribly bad and we'll have to wait until the end of the year to do this. This is what we have distilled from our Ony run. Again, it was a very good attempt. We got her to just over half. 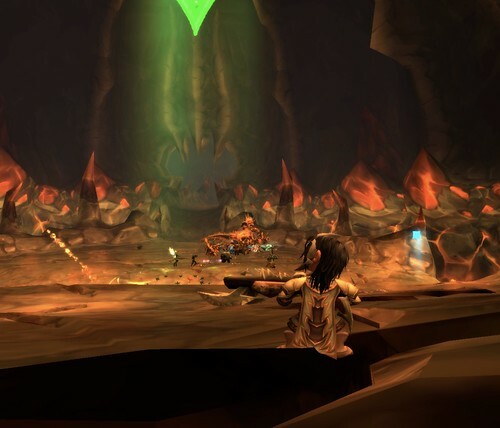 We're going to try again at the end of July and then, if we don't down her, the raid will be put on hold because, well, we have to save Azeroth, yet again, but this time from the horde. We'll be doing other things for a few months. If you have any observations we may have missed, feel free to put them in the comments.